I love California but this road trip has been horrific. The Yankees fought back in this game time and again and took the lead in the 10th, only to lose another game with a rookie pitcher on the mound. I am not pinning this on Giovanny Gallegos but it's a testament to the mounting bangs and bruises on this team. After the Yankees failed to score with the bases loaded in the first inning, the A's took the early lead in the bottom of the frame with a solo shot by Jed Lowrie. The A's took a 3-0 lead in the second when Adam Rosales doubled off Jordan Montgomery, following a walk by Matt Chapman, making his Major League debut, and a ground-rule double by Josh Phegley, scoring both base runners. The game stayed that way until the sixth. In the top of the inning, Chase Headley singled with the bases loaded to score two runs. Chris Carter followed with a single to tie the game at 3. The A's replaced starting pitcher Sonny Gray with Sean Dolittle who retired the next two Yankees to get out of the inning. In the bottom of the 6th, Yonder Alonso homered as the A's re-captured the lead, 4-3. The seesaw battle continued in the 7th inning when Gary Sanchez doubled with Starlin Castro on second, scoring Castro with the tying run. But the A's answered the run with a run-scoring single by Chad Pinder in the bottom of the inning and the A's were back up, 5-4. Chris Carter homered in the top of the 8th to once again tie the game, 5-5. Like the inning before, the A's answered the call in the bottom of the inning when Matt Joyce hit a grounder into a force out with the bases loaded and only one out, scoring the lead runner. 6-5, A's. Tyler Clippard had started the inning but he was ineffective (again) as two of three batters he faced reached base through a single and a walk. Dellin Betances was on the mound when the A's scored their run, but he was able to strike out Rajai Davis to prevent any further damage. 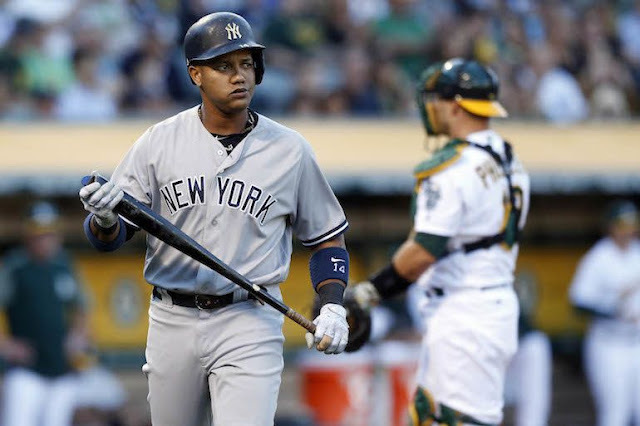 The 9th inning saw the Yankees tie the game again when Starlin Castro doubled off A's closer Santiago Casilla and Gary Sanchez followed with a run-scoring single. Gary Sanchez stole second to give the Yankees a runner in scoring position (replaced by pinch runner Ronald Torreyes as Sanchez came out of the game with a tight groin) with only one out, but Didi Gregorius and Chris Carter could not move the runner. Didi flied out, and Carter went down swinging on a 3-2 count. In the bottom of the 9th, the A's loaded the bases with two outs against Betances but he was able to get out of the inning by striking out Matt Chapman. The Yankees took their first lead of the game in the 10th when Starlin Castro hit a sacrifice fly with the bases loaded. Matt Holliday, entering the game at DH to replace Torreyes, struck out against A's reliever Liam Hendricks to end the inning. The Yankees could have used a few insurance runs on this night. In the bottom of the 10th, Giovanny Gallegos replaced Betances. He retired the first two batters he faced, but then Rajai Davis singled and Chad Pinder doubled to move Davis to third. Jed Lowrie was intentionally walked to load the bases. 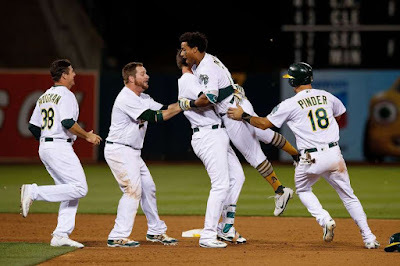 Khris Davis ended the game with a single just over Starlin Castro (ball tipped off his glove), scoring Davis and Pinder with the winning runs. A's emerged with the 8-7 victory in another lost opportunity for the Yankees. Manager Joe Girardi summed it up after the game, "It hurts because it's a matter of a couple inches that you lose that game by and it's frustrating." This was another game that shows how much the Yankees miss closer Aroldis Chapman. It will be good to get Chapman back this weekend (hopefully on Sunday) so that Betances can get into games earlier and lessen the reliance on other arms. Fingers crossed for both Gary Sanchez and Aaron Hicks who also left the game in the 9th with tightness in his Achilles Heel. After the game, it was disclosed that reliever Adam Warren is battling tightness in his trapezius muscle which accounted for his unavailability. Hopefully, none of these ailments are serious. Didi Gregorius singled in the game to extend his current hitting streak to 17 games. Fortunately, the Yankees (38-26) did not lose any ground to any AL East team except the Toronto Blue Jays as everyone else lost. The Boston Red Sox and the Tampa Bay Rays remain 2 games and 5 1/2 games behind, respectively, while the Blue Jays moved up to 6 1/2 games back (bringing the Baltimore Orioles into a tie for the AL East cellar). Hopefully, better results await the Yankees today. Ronald Herrera, we hardly knew ye. 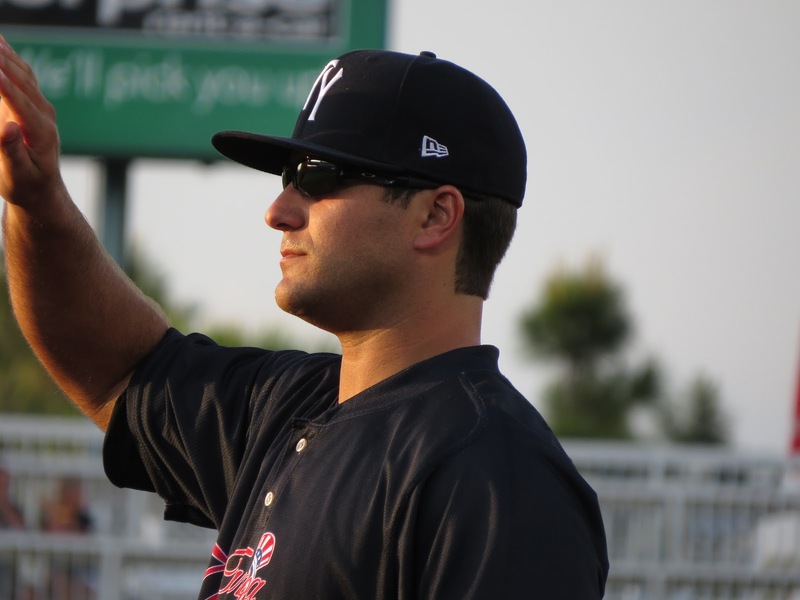 After taking the loss in his lone Big League appearance on Wednesday night, Herrera has found himself back with the Double A Trenton Thunder. I thought it was much to ask of Herrera to make the jump from AA to the Majors, and the proof was in the pudding with the pitch he threw Andrelton Simmons. What works in AA goes for a long home run in the Big Leagues. The Yankees also placed CC Sabathia on the Disabled List, as expected. To replace Herrera and Sabathia, the Yankees have recalled Luis Cessa and Domingo German. Sunday's starter has not yet been determined but Girardi has a pool of Cessa, German and Chad Green to choose from. Cessa appears to be the favorite to start on Sunday (or on Saturday if Girardi decides to push Masahiro Tanaka back a day). The Yankees stopped the rehabilitation for Greg Bird yesterday and he'll see Team Physician Dr. Christopher Ahmad today. Bird told Trainer Steve Donohue on Thursday morning that the leg was not feeling right and not functioning right. This is not good news. The Yankees are already suspect at both infield corners. Tyler Austin has not exactly set the World on fire at Scranton/Wilkes-Barre. He is currently batting .303 but only has 1 homer and 6 RBI's in 17 games (66 AB's). In my opinion, the best first baseman in the system is Thunder first baseman Mike Ford. This year, including his time at AAA, Ford, 24, is batting .289/.410/.509 with 10 home runs and 43 RBI's. He has played 61 games and has walked 44 times. He even stole a base...once. But he has the same disadvantage as Chance Adams and others, he does not have a place on the 40-man roster. There was already talk the Yankees needed to upgrade at third. If the priority becomes first base, does this increase the likelihood that we'll see Gleyber Torres as soon as next month? I still think it is too premature for him and his AAA manager is on record saying that he is not ready yet. I guess this is why GM Brian Cashman is paid to make these decisions. The added pressure on him is the moves over the next 45 days will go a long way toward determining his future at the end of the year with the expiration of his contract.